Today im sharing a butterfly shaker card. 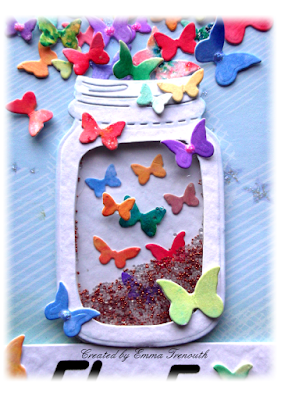 I had the idea of all the little butterflies flying out of the jam jar. All the butterflies were die cut from those tiny little scraps of watercolour backgrounds. Im always loathed to throw away anything from the backgrounds i make with brushos and inks. Im hoping to join in my first blog hop here which has been set up by Darnell to say THANK YOU to Di who runs pixiescraftyworkshop a blog to help us use up our snippets/left overs/scraps of craft stash. Di invited me to join in the fun last autumn after coming across my blog and saw that i like to use my 'left overs' and i have joined in a few times since then. I was super lucky to win one of her very generous free draws just before Christmas and won a lovely set of stamps & dies. I hope to join in alot more this year and get more visits in to the other players blogs as they are so inspiring with their ideas for snippets. Its a great incentive to use up those snippets instead of hoarding them. Thank you Di and Thank you Darnell too for setting it up. A5 white card blank. I took a pale blue pattern paper and using shaded lilac DI i stenciled various stars. I added this to the cardfront. I then die cut the jam jar twice from white card, in one of them i cut out the middle part and added acetate behind it. I added foam tape all around the edge of my window. I then added a mix of orange and clear micro beads and added the second jar die cut to the back to seal them all in. I computer printed my sentiment and cut into a large strip and added on foam tape to the card front, i then added my jam jar onto to look like its standing on the sentiment panel. I then got busy die cutting lots of tiny butterflies, its not too bad as the memory box die is joined together so you can cut 5 at a time. Once i had a good mix of colours i started arranging them, adding some flat to the background and others on glue gel with the wings bent up to add dimension. A few touches of stickles glitter glue to finish. A close up on the shaker element, i also glued a couple of butterflies to the back panel to help with the feeling of them leaving the jar. All the butterflies, over lapping them and building them up in layers helps to make it look fuller with more butterflies. Cutting all the butterflies wasn't as bad as it sounds, its ideal one to do on my little baby blue machine on a lap tray in front of the tv. My gosh Emma your cascade of colorful butterflies are stunning. That is gorgeous Emma. I love the little butterflies. A brilliant idea and a beautiful card. So very colourful and cheerful. I could make at least of these with my scraps! This is amazing, wonderful way to use your scraps Emma. This is brilliant! I love, love, love all of those adorable and colourful butterflies escaping from the jar! Awesome use of snippets and beautifully designed card! This is so pretty! I love all those gorgeous butterflies! 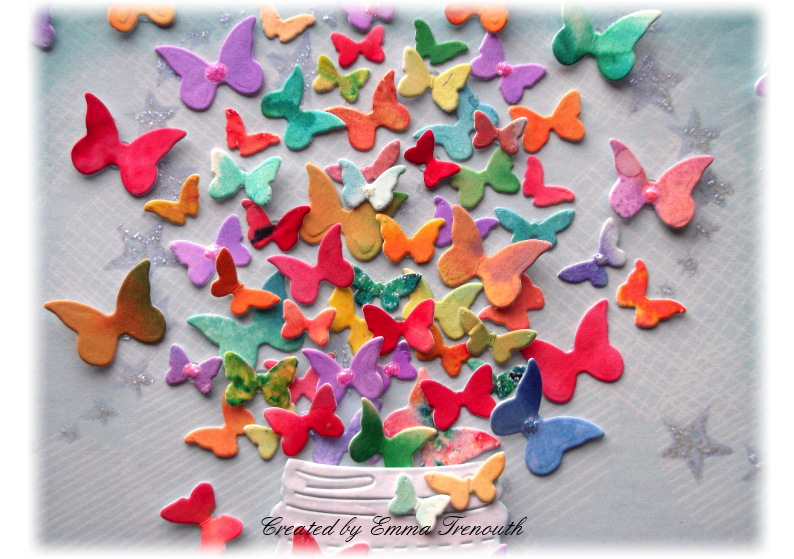 Woweeeee, what fun Emma, love all those butterflies, that’s a lot of work and a lot of snippets very clever of you! I can’t imagine doing that many. Thanks for popping over to my blog, I’ve just joined your blog and would love it if you’d do he same to my blog. Good to see you in this challenge and blog hop. Two special ladies, Di and Darnell! This card is a delight to the eyes and to the spirit. I am sure that Di will adore it. I just love it. What a happy card. This is absolutely gorgeous .. .. love it!!! Such a beautiful burst of colour too. A great way to use up snippets that's for sure! I had to smile when I saw your card because I keep a little jar of pre-cut butterflies and I imagined them all escaping out of it. LOL!! Hope your snow hasn't caused you any problems. Oh it is so bright and colourful and just gorgeous. What a great idea. Stunning butterfly shaker card - you must have LOTS of patience! There's a raucous celebration going on behind the bike sheds .. . come along if you dare! WOWser Emma!! I really do adore this card, as Kathy A quite rightly predicted. It's utterly fabulous! I bet there was a load or work making it, despite the die cutting several butterflies in one go. And, you will get to know over time, of course I had to pop right out and buy the butterfly die - one for me and one for the snippets playground toy bax of course! Not that I could ever make a card approaching this one! I was such a surprise to find out about Darnell's blog hop - many thanks for your kind words. Needless to say I'm really deeply touched by so many wonderful friends joining in - what a wonderful gesture. Thank you so much! Brilliant and so beautiful!! Wow! LOVE!! Great use of your snippets and a fabulous workto celebrate Di!! What a fabulous card, great use of snippets and some really lovely colours and design. Thank you so much for your comment. I love the concept of this wonderful card and how beautifully you put it all together! The fluttering butterflies look amazing!! Amazing creation! 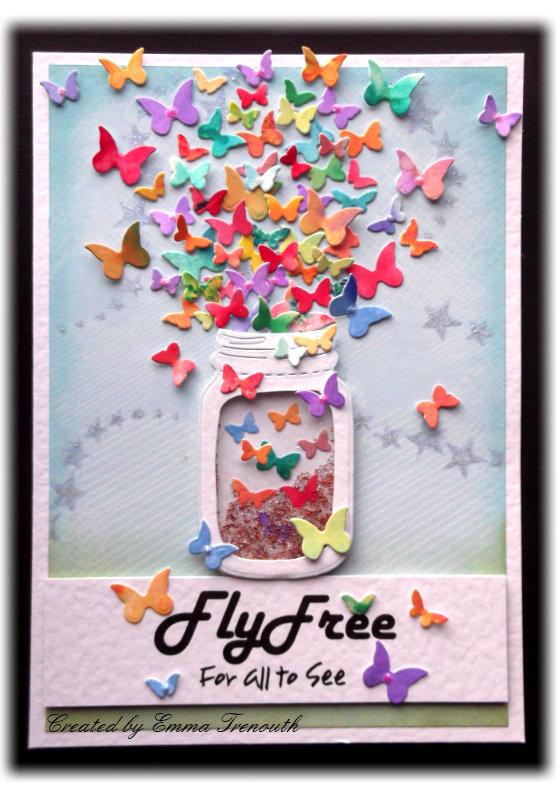 A fabulous snippets card Emma, lovely effect with all those brightly coloured butterflies. Oh wow wonderful butterfly card goes so well with my butterfly bush outside my window. Every time I go outside there is a rush of butterflies. Great idea to use up those tiny snippets I have a box full of tiny butterflies cut out with a punch you have inspired me to get it out and do something with them. Lovely to see you on my blog. 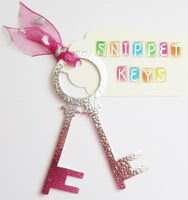 Gorgeous snippets project for a lovely lady! A gorgeous kaleidoscope of colourful butterflies! So bright and cheery - brilliant use of snippets. What a colourful feast for the eyes... your beautiful jar of butterflies...reminds me of a song...oh that was jar of hearts...close? This must have taken you ages!